“Oh my goodness. The Bears season’s going to end on a double doink. Unbelievable. How many times can they hit the upright?” Those words echoed across the stunned silence in every bar and living room in America, especially Chicago, after Cody Parkey’s game winning field goal attempt fell short. The Bears first round playoff game against the Philadelphia Eagles will be a classic that’s discussed for years, for all of the wrong reasons. Parkey had suffered from inconsistencies and a strange tendency to hit the goal posts all season. 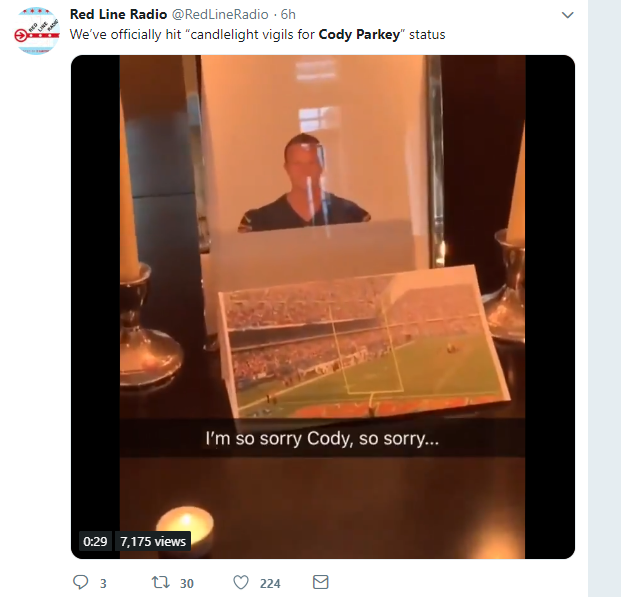 Fans and media personalities in Chicago had voiced their concern about Parkey before the playoffs began, so you can imagine the immediate aftermath on social media. There were some regrettable actions and tweets from fans in the moments following the double doink. A mixture of pity and vitriol from a frustrated fan base, tearing furniture apart, setting things on fire, classic Chicago stuff. Ultimately footage proved that the kick was tipped by Eagle Treyvon Hester, as shown in this Chicago Tribune article, but history will most likely only remember that a struggling kicker managed to hit the goalposts once again. Not to rub salt in the wound here, but this really is what’s trending the most in Chicago right now. 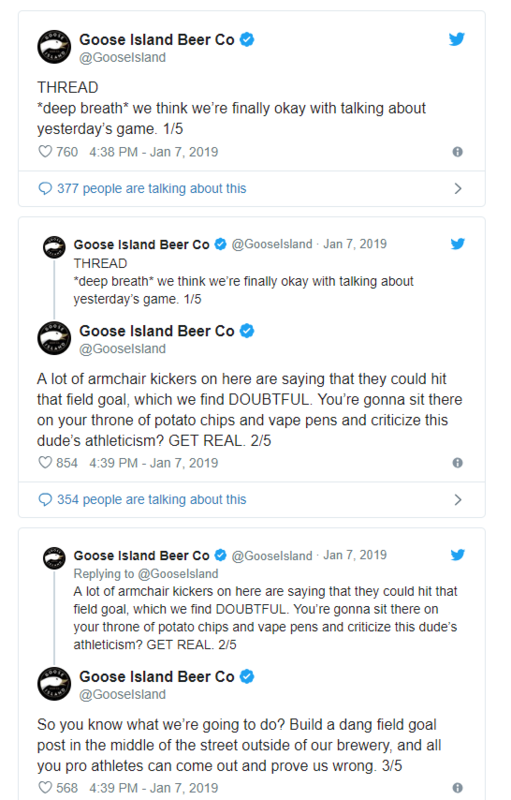 The Goose Island Beer Company is trying to make folks feel better about the sickening finish to the Eagles game by offering free beer for a year and “eternal glory” to anyone who can successfully kick a 43 yard field goal. The brewery is actually not (entirely) taking a shot at Cody Parkey here, it’s more of an attempt to humanize the Bears kicker, according to an article from NBC Sports Chicago about the promotion. 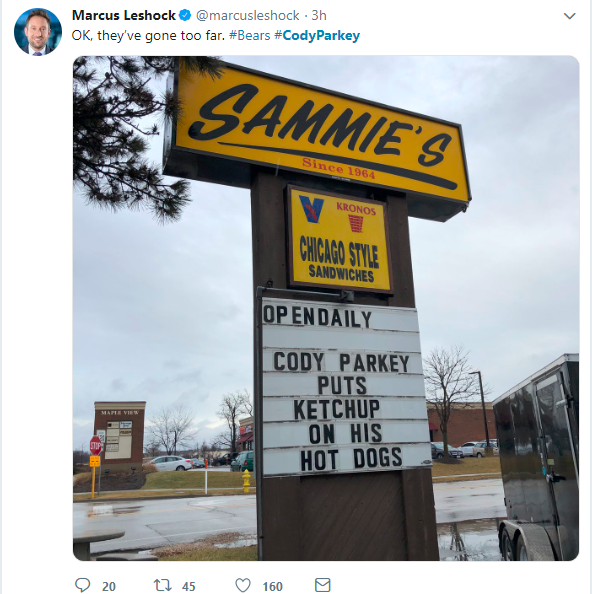 Parkey has an incredibly hard job, and the hundreds of thousands of people across the city who claimed they would have drilled that 43 yarder will have the opportunity to put their beer money where their mouth is. The competition will take place during regular taproom hours at Goose Island on Saturday, June 12th. John ‘Jack’ Lyle was a decorated war hero who served in World War II with the Tuskegee Airmen and was awarded a Congressional Gold Medal in 2007. He died this week of complications related to prostate cancer. Lovingly referred to as “Captain Jack,” Lyle was among the last survivors of the Tuskegee Airmen, a trailblazing group of African-Americans who integrated aviation in the military in World War II. Jack was born and raised in Chicago, and grew up on the South Side and joined the military in 1943, opting for a career as an airman instead of a foot soldier, despite the rampant discrimination within the military at the time. During his time in the service, Lyle became a known for his heroism. But for him, it was just part of serving. In addition to his military service, Lyle was a part of a group of African-Americans that helped to integrate the Jackson Park Yacht Club. A notoriously skilled sailor with over seven boats to his name throughout his life, Lyle became the oldest person ever named “Yachtsperson of the Year” by the Chicago Yachting Association. City Alderman’s don’t often make the news, or at least the kind of news that is all that interesting to read. Brian Hopkins (2nd) did however grace the headlines of a Chicago Sun-Times report that he put an end to the massive Lincoln Yards development to house multiple entertainment venues, including a potential soccer stadium. “The idea of 20,000 fans coming to an event, then leaving hours later creating massive traffic tie-ups throughout the community—not just on the Kennedy. All the arterial streets in the vicinity would have become gridlocked,” Hopkins said. The Alderman went on to say the amount of traffic to the neighborhood, which has already been vocal about wanting more parks and green space to enjoy, would be an undue burden. Hopkins said his decision to nix the plan stemmed from an avalanche of opposition to the stadium and entertainment district unleashed in a pair of neighborhood surveys and in emails, phone calls and testimony at jam-packed community hearings on the Lincoln Yards development. In addition to the neighborhood citizens who voiced hesitation, the independent music scene in Chicago was very concerned that Live Nation was one of the owners of the district. In November, the Hideout and several other small music venues in Chicago said they were “banding together” in an effort to slow the project for fear it would starve them of talent and drive them out of business.